Consider the situation, illustrated in Figure 4.3, in which a horizontal jet of fluid emerges from an orifice in the side of a container. As shown in the figure, the jet narrows over a short distance beyond the orifice that is comparable with the jet diameter to form what is generally known as a vena contracta--that is, a ``contracted vein.'' 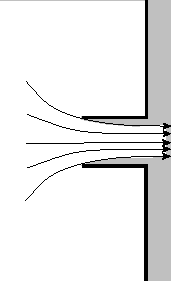 The jet is bound to narrow in this manner because of the curvature of the lines of flow as they pass through the orifice. The narrowing of the jet implies the existence of a transverse pressure gradient. In other words, the pressure at , on the axis of the jet, is higher than the atmospheric pressure that acts at . The pressure excess at suggests that the fluid on the axis is still accelerating longitudinally as it leaves the orifice. Only in the vena contracta does the flow velocity becomes uniform, and the pressure atmospheric, all the way across the jet. Figure 4.3: Outflow through an orifice. where use has been made of Equation (4.15). Thus, we conclude that the contraction coefficient takes the value . Figure 4.4: A Borda mouthpiece. In reality, Bernoulli's theorem suggests that when the orifice is opened the pressure on the walls in the neighborhood of the orifice will fall below the hydrostatic value, which implies that the accelerating thrust is actually greater than . Consequently, . Obviously, cannot exceed unity, so we conclude that, in general, . For instance, if the orifice is a circular hole punched in a thin plate then the contraction coefficient is observed to take the value (Batchelor 2000). Suppose, however, that we fit a small cylindrical nozzle projecting inward from the orifice, as shown in Figure 4.4. In this case, the original assumption that the pressure on the walls in the neighborhood of the orifice is hydrostatic is essentially correct. 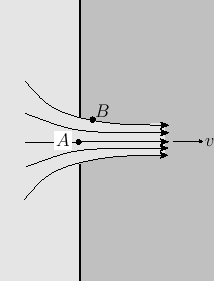 This follows because the region where the lines of flow are converging on the orifice is far removed from the walls, and the velocity of the fluid in contact with the walls is negligible. Thus, the contraction coefficient is exactly . This arrangement is known as a Borda mouthpiece, after Jean-Charles Borda (1733-1799).